BPA is ubiquitous, and almost impossible to avoid. It can be found in everything from cash register receipts to measuring cups. There are tens of thousands of chemicals on the market. 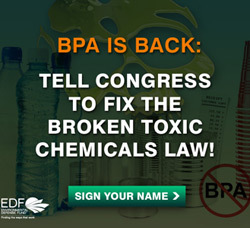 An estimated 1,500 of them are recognized as potential endocrine disruptors, like BPA. They can lead to a suite of health issues, from learning disabilities to obesity to infertility. And they are so ubiquitous that they are even found in the bloodstreams of newborn babies. Take Action: Make sure your members of Congress know that protecting American families from exposure to harmful chemicals is important to you! I am deeply concerned about the continued use of toxic chemicals that we know are dangerous, and the even larger number of untested chemicals that appear in a broad range of consumer products, from carpets to computer screens and from baby products to couches. Every American alive today has hundreds of hazardous chemicals flowing through our bodies. I hope you will make this a priority and work with your colleagues in Congress to protect our families from exposure to dangerous toxic chemicals. Thank you.